I was interested in this movie mainly because I was intrigued by the interesting story plot. I was thinking, "THIS GUY HAS AWESOME SPERMS MAN! 533 children with his sperm donations! Is this a Marvel or DC superhero movie... THE SPERM-MAN?" 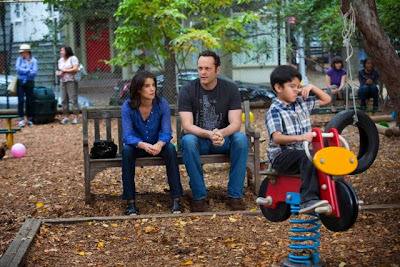 "Look lady, when's your kid getting off BECAUSE I HAVE BEEN WAITING FOREVER TO RIDE IT"
Synopsis: Vince Vaughn plays a typical "useless man" in the movie - unreliable, underachiever, and owe lots of money. One random day, a lawyer appeared in his house, and told him that he is the father of 533 children because of his EXCESSIVE sperm donations 20 years ago, and also because his sperms were the BEST (LOL). And 142 of these 533 children went to court together, demanding to see their biological father. Of course when he donated his sperms, he signed the confidentiality agreement so it's not so easy for them to know their real father. He stands to get a large amount of compensation as well if he wins the lawsuit, which he can use to pay his debt. 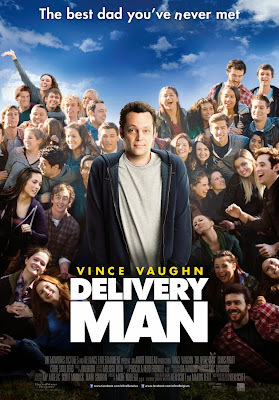 Review: To be honest, I have never really liked Vince Vaughn's movies, except for Wedding Crashers. His kind of funny is not my type of funny. But in this movie, the laughs are there because of the absurdity of the whole situation. And the scriptwriters were brilliant in juxtaposing the audience by having scenes saying it is disastrous to have babies, then came the news that he has not 1, not 2, not 3, not 4, not 5, not 6, not 7, not 8...................... not 532 but 533 CHILDREN. I went into this expecting it to be a full-on comedy. But in actual fact it is half comedy, half life lessons. You get to see how he interacts with his daughter who can't seem to quit drugs, his son who has his dream audition of being an actor but can't go because he is stuck in his cafe job, and a son who has down-syndrome. Half of the movie you are laughing, half of the movie you are like "AWWWWWWWW, I am touched".